Dark Roasted Blend: Mystery Photo: One Seriously Empowered Motorcycle. Mystery Photo: One Seriously Empowered Motorcycle. Any ideas what it is exactly? Can it fire?? It's the work of the French Military! "So, what's the most unusual military vehicle you can think of? Maybe the Japanese airplane-launching submarine of WW2? Or perhaps the Soviet attempts to build a flying tank? Or perhaps the 1000 ton rolling fortress the Germans tried to build in WW2? All quite odd, I agree, but barely made it past the drawing boards. For us, the oddest is a scooter armed with a 75mm cannon. After World War II, there was little money for defense spending while the nations of Europe rebuilt their industry and society. When there was some cash to spend, one had to be creative to stretch it as far as possible. The French probably accomplished the most astounding example of that with the ACMA Troupes Aeról Portées Mle. 56. Deployed with their airborne forces, this was essentially a militarized Vespa scooter outfitted with a 75mm recoilless rifle. Five parachutes would carry the two-man gun crew, weapon, ammunition, and two scooters safely to earth, and the men would load the weapon on one scooter and the ammo on the other, then ride away. More impressively, the recoilless rifle could be fired effectively on the move by the best of the gun crews. Total cost? About $500 for the scooter and the recoilless rifle was war surplus. Were they successful military machines? Well, the French Army deployed about 800 armed scooters in wars conducted in both Algeria and Indochina." Apparently, recoil was not a problem whatsoever, and this little scooter could (and did) wreak serious havoc. For the love of Pete - it's the work of the French military! So, what's the most unusual military vehicle you can think of? Maybe the Japanese airplane-launching submarine of WW2? Or perhaps the Soviet attempts to build a flying tank? Or perhaps the 1000 ton rolling fortress the Germans tried to build in WW2? All quite odd, I agree, but barely made it past the drawing boards. 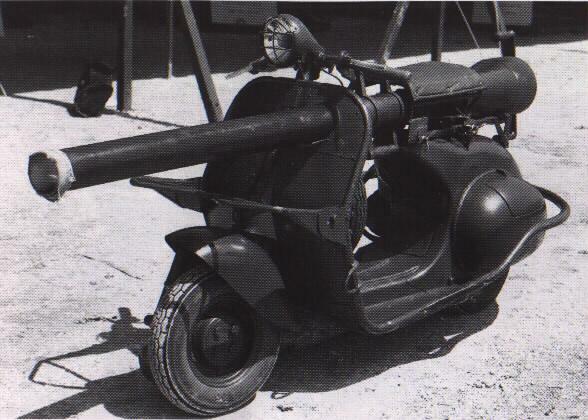 For us, the oddest is a moped armed with a 75mm cannon. After World War II, there was little money for defense spending while the nations of Europe rebuilt their industry and society. When there was some cash to spend, one had to be creative to stretch it as far as possible. The French probably accomplished the most astounding example of that with the ACMA Troupes Aeról Portées Mle. 56. Deployed with their airborne forces, this was essentially a militarized Vespa scooter outfitted with a 75mm recoilless rifle. Five parachutes would carry the two-man gun crew, weapon, ammunition, and two scooters safely to earth, and the men would load the weapon on one scooter and the ammo on the other, then ride away. More impressively, the recoilless rifle could be fired effectively on the move by the best of the gun crews. Total cost? About $500 for the scooter and the recoilless rifle was war surplus. Were they successful military machines? Well, the French Army deployed about 800 armed scooters in wars conducted in both Algeria and Indochina. That's the only time I've seen a Vespa that could honestly be called a crotch rocket. So recoil wasn't a problem with a recoiles rifle? Crazy. moped is how they call it in the linked article. However, you are right, and I changed the quote. 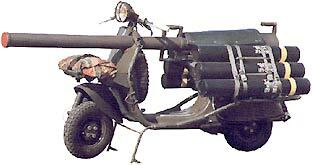 I saw this contraption in another article that says the Vespa was only used for transporting the rifle. I think that is probably the truth because, if you look at the way the rifle is mounted, there is no way to adjust the elevation of the weapon independent of the scooter. you can't be supposed to sit on it while fireing? right? Hmm, this is certainly a way to consider adapting my scooter so that people in cars/trucks/SUVs will pay attention and not cut me off! 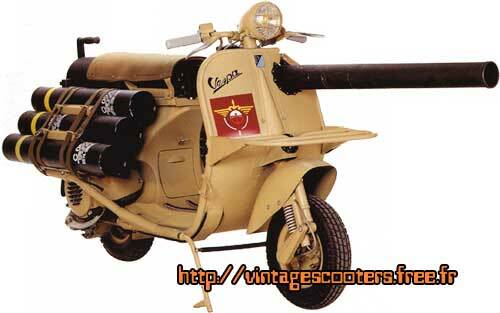 The Vespa was designed to utilize the surplus starter motors from WWII Italian aircraft. The Vespa is the ultimate example of beating swords into plowshares. I do not appreciate the French military turning our lovely freedom wheels into messengers of death. Aside from the problem of fixed elevation, there's absolutely no reason why this couldn't be fired with a rider on the saddle. Recoilless rifles up to 105mm were fired from the shoulder, so the only thing stopping someone from firing this is the psychological impediment of having it between their knees. The 75mm was light enough to be shoulder-fired by a strong man, but was usally fired from an ordinary machine-gun tripod. 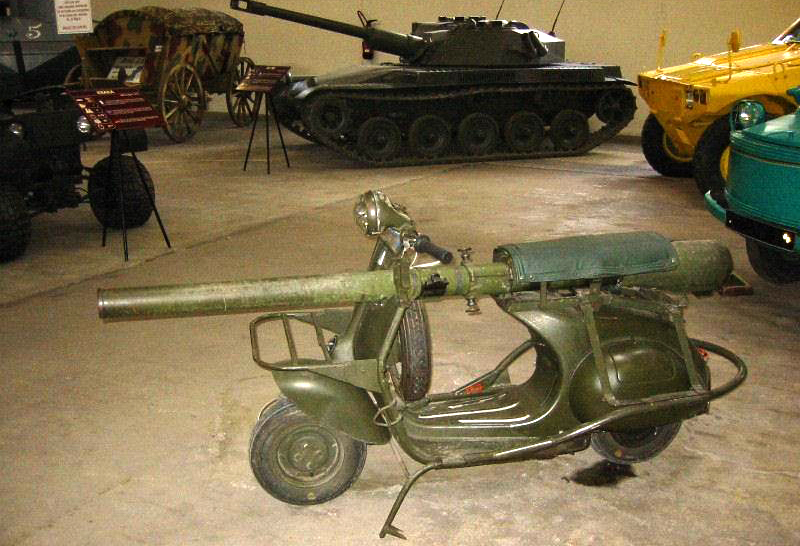 What looks odd about this thing is that the gun doesn't look easily removable from the Vespa. It's got to be drawn back until the muzzle clears the hole. The tripod, and more ammo, could certainly be carried on the other Vespa. And that all makes sense. Shooting the gun while mounted on the Vespa: that seems pretty desperate. Elevation wasn't a problem - it's a recoilless rifle, not an artillery piece. This was designed to fire rockets, not bullets. The rockets travelled essentially in a straight line, so "up-arcing" was not needed. I'm sure that the rifle was designed to be fired whilst installed on the scooter. Recoiless rifles don't use 'rockets' either. It works just like a regular artillery piece except that the casing is perforated (holes up and down the brass case, lightly covered but that blow out upon firing) and the rear of the artillery is ported. When fired, equal energy goes out the case holes and through the rear of the gun (blast) to counter the recoil of the shell going out the business end, thus 'recoiless'. Don't be standing behind one when it fires - you would be roasted! Recoiless rifles fell out of favor by the '70s - early '80s, due to the shell weight (all that extra powder to just go out in the rear blast) and with the introduction of wire guided missles, et al. Don't stand behind it, though, it throws an equal mass out the back to cancel the recoil. They also fitted 75mm recoillesses to B-25 bombers in WW2 and used them for shooting up trains and armor on the ground. I"ve never seen a more stunning example of a bunch of guys who have no idea what they're talking about. I'm the owner of such a Vespa TAP Military Scooter and also search information for several years now. There is a "huge hill" of wrong information written. The person who was write the M20 75mm could fired from the shoulder of a strong man didn't have seen ever this canon in real or did transportet it from one point to another point. The manual from the US Military is speaking of a six man team. The firing was every time from a tripod which was also transported with this Vespa. Normaly a collector has only the Vespa and the M20 75mm. Firing fixed from the Vespa was impossible, because by driving you didn't had any change to be in a fixed route. But there are also other different points because it's impossible. The Vespa had his own constructed motor and never ever a surplus starter motor from a aircraft. This is realy a fairytale. Again: "I'm sure that the rifle was designed to be fired whilst installed on the scooter." I was spoken with a old military soldier from the french army who was ridding such a Vespa in Algeria. IT WAS IMPOSSIPLE TO DO THIS. Also the had big problems with this Vespa and their 8" wheels in the sand to drive with this complete package (6 rockets, tripot, M20 75 MM, driver, diff. small things, some fuel add.). 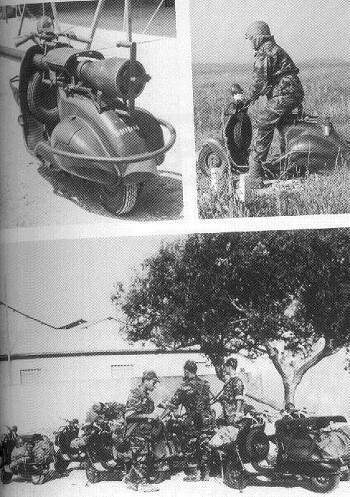 The conception was changed into Vespa scooter with a radio equipment in a trailer (as seen also on photos from the museum of piaggio). if it wasnt designed to be fired while attached, why mount it through a hole in the front? wouldnt it have been simpler to mount and easier to remove if just lashed to the side? either way if anybody has any official documentation on it that would be great. it is a very interesting vehicle. You don't remove the rifle by pulling it backwards. The saddle has hinges so you can easily open it sideways. If you look closely, you will see that there's a latch on the front shield just above the muzzle of the gun. This latch can be removed easily, thus making it possible to lift the rifle of the Vespa. Quite ingenious really. Remember this was the 50's. The first model appeared in 1956 and the second one in 1959, the differences being in the materials used for the cooling hood of the engine and the ACMA badge. No wonder the French lost both Algeria and Indochina . . . Very neat little contraption... A bunch of nitwits pretending they know what they're talking about though. "Rifle" and "cannon"; these words have nothing to do with missiles. It fires an artillery shell. And firing a 75mm cannon (let alone 105mm) on a man's shoulder is about the dumbest thing I've ever heard. Recoilless rifles aren't cannons either, they are their own type of weapon. It is a crazy scooter there. Modifiying the scooter and doing a custom retrofit on it. The US did NOT put 75mm recoiless rifles in B-25 bombers during WW2. Those were 75mm howitzers. I have a TAP French military patch that I had bought from an old Vietnamese soldier some twenty years ago. It's red with the words TROUPES AERO PORTEES in yellow. There is an eagle (?) sitting on top of an boat anchor in front of open parachute. scooter armed with a 75mm cannon, what a stunning weapon it would be. Recoilless rifles like this one do not throw equal mass out both ends. The base of the shell and some propellant gasses are ejected out the back much faster than the projectile goes out the front. The kinetic energy going both ways is very close to the same, but the lighter mass going out the back has a much shorter danger range. The problem with such weapons is a lack of efficiency. The projectile range is reduced quite a bit from what it'd be with all the gas pushing it out the front, but then there'd be recoil force on the tube, which would also have to be thicker and heavier. Self contained, lightweight rockets like the TOW, SMAW, and others have made recoilless rifles obsolete. "Vespa Scooter" an italian peice. Vespa is known for its monocoque design, which is the most prominent characteristic of this scooter, with single peice steel body, bright and shining paint.